Wisdom in the oddest places. I think i used to be a movie buff. All those years when I didn’t have any real responsibilities. I would keep a pen and paper ready to catch when the box office countdown came on and make a list of all the “like to watch ” that came on. I am also quite the storyteller (can’t you tell ) so I provided premium entertainment to my family and friends who have not had the opportunity I had to watch these movies. This was long before “spoilers” became a thing. Spoilers are still not a thing to me, personally I’d prefer to have you tell me about a movie I was skeptical about before I proceed to watch (and enjoy) it. So if I love a movie, I could see it over and over again, till I can probably say all the lines in said movie scene for scene. Fortunately, wisdom is not a snob. It creeps up where you least expect and make more impact in your life than the hour long admonition you may receive. Soundtracks to movies and lines in the script(in fact some scriptwriters are bae!) have contributed to my endearing self () and now I will proceed to share some of the wisdom the hours spent watching the underlisted blessed me with. It’s only icing on pudding that it had a great lesson for me to pick on. I’m one of those people who find contemporary very attractive. I love artsy people, crafty people, that kinda thing. The popular rule says All that glitters is not Gold. Now that that fact has been established, the contemporary rebel in me is asking for a revision.Gold is considered prime export and definitely cannot be available to everyone. So I’m interpreting it as instead of seeking to golddig at the already crowded gold mine, be a shooting star, break the mould of gold-hunt and convert the resources available to you to your gold. In simpler terms appreciate the opportunities around you, break whatever unfavourable rules( oh yea..fight the power ✊) and achieve that which you consider worth it. 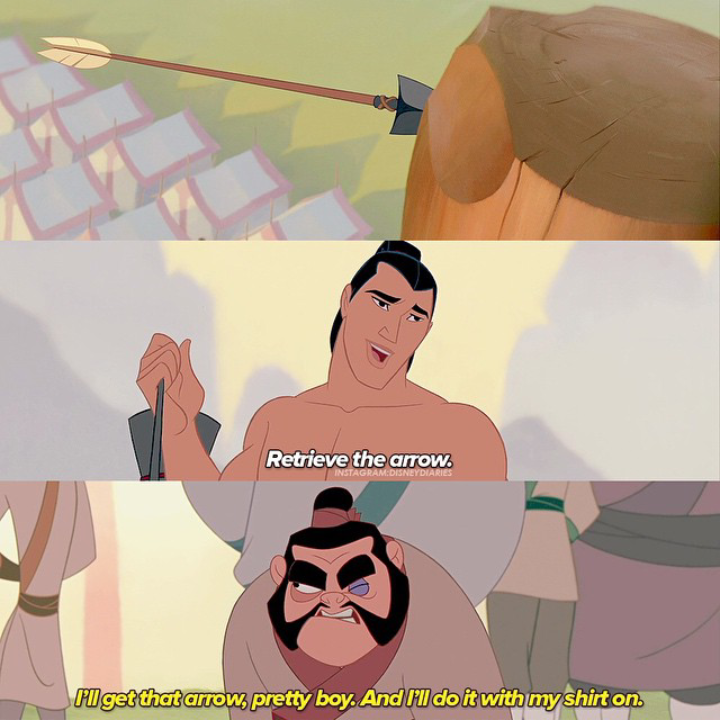 I saw Mulan so much, I could say the scenes. It had me feeling some typa way. I still say I can do stuff with my shirt on”, and I wonder if the people I’m talking to recognise the line. And hope they do! But that’s not the line I ponder on sometimes. It’s when Mulan sang “when will my reflection show who I am inside” that I remind myself to be true to myself. There may be impressions to be met but they must not compromise with the values that comfort me at night. We improve everyday abi? Meanwhile, I shld treat my chairman to Mulan, been ages mehn! I’m a total BardenBella fan! I don’t know how many times I have seen it (who is counting?) And the next time is better than the last. My lesson of choice didn’t happen from a soundtrack or a line. It was a person. Jesse had (in my opinion) all the most amazing qualities in a person. He was funny, fine, sweet, forgiving and best of all, he treated everyone genuinely. There was absolutely nothing pretentious about him. He didn’t freak out that his roommate, Benji was the weirdo or that Beca was unreasonable sometimes. He was the definition of heart on a sleeve for me…an easy to read open book. Sort of like the kind of friend /person I want to be. Meanwhile Pitch Perfect 2 was ACCAMAZING! If u haven’t seen it yet, you are on a long thingggg. I think I’ll stop here. Because if I didn’t, I probably wouldn’t stop, I’d move to how Ironman is the king of comebacks and arrogance is a must-have (except you may not agree entirely with me) or how Wolverine teaches lessons on making a tough choice…and I probably would have aching fingers in the end of it all. So now is a good time. Don’t stop paying attention, so you don’t miss these gems that come wit your entertainment. I realise I didn’t apologise for my hiatus. It was hard to be away (not that I had to) but it couldn’t be helped. I have been writing though. I’ll find time and share and hope it’s all worth your while. Peace and Love, as always.